The ash leaf cone roller, Caloptilia fraxinella (Ely) (Lepidoptera: Gracillaridae) (Fig. 1) started to get noticed in the cities of the Western Canadian prairies in 1998, well, in Saskatoon, SK at least. I know this because that summer the green ash, Fraxinus pennsylvanica (Oleaceae), in my front yard was covered in cone rolled leaflets and had not been prior to that year. I had just started working for the City of Saskatoon’s Pest Management Program that year and one of our mandates was urban forest insects…not that there was any budget to control them, but it piqued my interest in urban forest entomology. Fig. 1 – The ash leaf coneroller, Caloptilia fraxinella (Ely) (Lepidoptera: Gracillaridae) adult, pupal exuvium and cocoon. The following year, Chris Saunders with the City of Edmonton’s Pest Management Program, contacted us in Pest Management and asked if we had seen this cone roller on our ash trees because they had just noticed it on the ash trees in Edmonton. Greg Pohl had identified this leaf miner/leaf roller that year on all species of horticultural Fraxinus in Edmonton and published the identification and some life history of the moth in a 2004 paper (Pohl et al. 2004) along with a brief identification of several parasitoids that were reared from larvae and pupae. 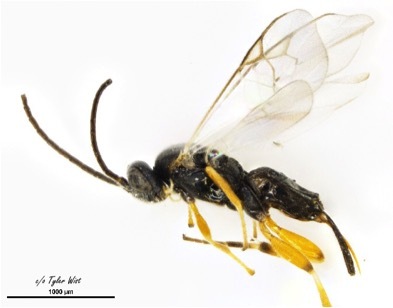 The lone braconid, identified to the genus Apanteles and found to be all one species by Darryl Williams of the Canadian Forest Service in Edmonton seemed to be the dominant parasitoid in this complex, but without a species designation not much else about the wasp could be gleaned from the literature. Chris Saunders suggested that I study the ash leaf cone roller as a master’s project but I digressed from urban forest entomology for a few years into pollination of a nutraceutical/agricultural crop. By this time, the ash leaf cone roller had spread to every ash tree in both cities and often rolled 100% of the leaflets on a single tree. I finally followed Chris’ advice and started a PhD project in Maya Evenden’s lab at the University of Alberta, which was the only lab in Canada that was working on the ash leaf cone roller problem (Evenden 2009). The Apanteles sp. was still the dominant parasitoid and so, along with studies on the chemical ecology of the moth (Wist et al. 2014), I also studied the third trophic level in this system (Wist and Evenden 2013). Of course, I couldn’t go through my studies without knowing what the species designation was for the dominant parasitoid wasp. Fortunately, Jose Fernandez-Triana had just begun his study of the genus Apanteles at the CNC in Ottawa and once Henri Goulet passed along the Apanteles specimens that I had sent for identification he quickly determined that this parasitoid was Apanteles polychrosidis Viereck (Hymenopetra: Braconidae) (Fig. 2). Apanteles polychrosidis kills the ash leaf cone roller larvae before they can chew their emergence “window” that they use to escape the cone rolled leaflet as adults. This behaviour gives a fairly reliable visual cue that a cone rolled leaflet without a “window” has been parasitized by A. polychrosidis because the other parasitoids in the complex emerge after the cone roller has pupated and created its escape route “window”. Unrolling the leaflet confirms the presence of A. polychrosidis if its telltale “hammock-like” cocoon is present (Fig. 3). This type of cocoon is thought to be a defense against hyper-parasitism but as we found (Wist and Evenden 2013) it doesn’t always work out for A. polychrosidis! Fig. 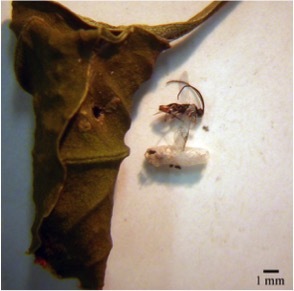 3 – Apanteles polychrosidis Viereck (Hymenopetra: Braconidae) adult above its cocoon and beside the leaflet cone rolled by Caloptilia fraxinella (Ely) (Lepidoptera: Gracillaridae). Note the emergence hole in the side of the leaflet that the wasp chewed to escape. To assess the percentage of parasitism by this dominant parasitoid I adapted a method that Chris Saunders and I had discussed years earlier for assessing the parasitism of Apanteles sp. on individual trees. For the initial experiment in our paper (Wist et al. 2015) I sampled leaflets to estimate the density of cone rollers on the tree and estimated the percentage of parasitism by A. polychrosidis on two of the common urban species of ash in Edmonton. Apanteles polychrosidis parasitism was higher on black ash, F. nigra, at all sites than it was on green ash, F. pennsylvanica, which can be called differential parasitism and it seems to be common when host larvae develop on two or more host plants, but had not been well studied on trees. When host density and parasitism were graphed, the relationship of parasitism to host density could be visualized by the slope of the regression line, and on black ash, parasitism was independent of host density on black ash, but was negatively density dependent on green ash. In other words, on black ash parasitism is always high but on green ash, parasitism declines as the density of C. fraxinella increases. I ran the same experiment on green and black ash trees in Saskatoon with the same results but we chose to leave them out of the final version of the manuscript. I was already studying the chemical ecology of C. fraxinella so this was where we looked for an answer to the differential parasitism in the field. I ran a y-tube olfactometer experiment with black and green ash plant material as the attractive source of volatile organic chemicals (VOCs) and this turned out to be rather tricky. I had three treatments that I wanted to test; undamaged leaflets, leaflets damaged by C. fraxinella and leaflets that were mechanically damaged. First, I tried to bag small seedlings as the source of the plant smell but I couldn’t seal the system well enough to get reliable airflow through the y tube chamber. I had to switch to using leaflets alone which raises the issue of the smell of the leaflets changing once they have been removed from the tree which could be a problem especially in the “undamaged” treatment. I also needed enough female A. polychrosidis hunting for hosts to give me a decent sample size so I had to collect and emerge as many “un-windowed” cone-rolled leaflets as I could in the summer, and hope that they would actually mate and want to oviposit into host larvae at this point in their lives. Another issue was that I couldn’t coax my summer emerged C. fraxinella to lay eggs on ash seedlings to create leaf-mined treatments. Fortunately, a subset of the local population of C. fraxinella had developed a second generation on the new ash leaves that a dying ash tree puts out in July in an effort to save itself. These leaflets became my leaf-mined treatment. Over two seasons with a lot of juggling and timing of three species I was able to gather enough experimental data with the olfactometer to discover that female A. polychrosidis were differentially attracted to the volatile odour cues from each ash species. In green ash tests, they were attracted to the smell of green ash alone but in black ash tests, they were not attracted unless the leaflets were attacked by its host. The “icing on the manuscript cake” was the GC-EAD results by co-authour Regine Gries that showed that 13 compounds in the volatile profile of ash could be sensed by the antennae of A. polychrosidis, and some of them are known to increase in response to herbivore damage. I’d say that this manuscript is a starting point for further studies on this interesting parasitism system and could accommodate projects from chemical ecology and landscape ecology perspectives at the very least. In fact, Danielle Hoefele and Sarah McPike have already begun projects in Maya’s lab on the Fraxinus–Caloptilia-Apanteles system. In case you’d like to know more, here is the link to our manuscript published in Arthropod-Plant Interactions. Editor's Pick: Resins, exotic woodwasps and how a study species picks a researcher.